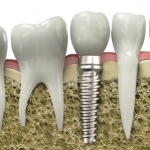 A dental implant (or tooth implant) is a device that goes in place of a root in order to support dental restorations. It acts as an anchor for other dental prostheses, like crowns, bridges, or dentures. Because dental implants need to be strong, they are generally made of materials like titanium and are actually placed within the jaw bone. Within just a few months, the tooth implant will fuse with the bone, allowing it to function and feel like an actual tooth. The primary limitation of implant dentistry is bone mass: there must be enough bone to accept the surgically implanted device. If a patient does not have enough bone mass to accept the tooth implant, then options (such as grafts) may be considered in order to enable the procedure. Do I Need a Tooth Implant? Dr. Clint Blackwood will be able to recommend the proper work to be done for your unique situation, which may include dental implants. 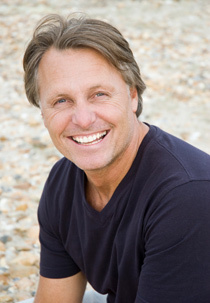 He can both place and restore dental implants, including mini implants where appropriate at his Salt Lake City practice in Murray, UT. If you have dentures or are considering them, you may want to think about implant-retained dentures! This is a great alternative to traditional dentures and solves some of the most common problems. Implant-retained dentures are a type of over-denture that attaches firmly to dental implants. They promote healthy bone and slow bone loss that is so common when teeth are lost. Implant-retained dentures are much sturdier than traditional dentures and improve chewing and speech. For a procedure like dental implants, you want a dentist who has the skills to not only diagnose a problem but who will be able to perform the implant dentistry procedure from placement to restoration instead of sending you back and forth to other dentists or specialists. Having a dentist who knows you and your unique situation will allow him to give you the quality care you deserve. We do it all at Salt Lake Dental Care near Sandy, Utah! And as a cosmetic dentist, Dr. Blackwood understands how important it is for your new dental implants to blend in and to function like natural teeth. He’ll be with you every step of the way, from diagnosis, to the final restoration when you can walk out of the office with a beautiful new smile. If you think you may need a tooth implant, give our Murray, UT office a call today! Our friendly and knowledgeable staff will be happy to answer any questions and set up an implant dentistry appointment if you are in the Salt Lake City area, including Sandy, Utah!